Over the course of its two weekends, there are nearly 300 artists performing at Ultra Music Festival this year. In 2013, the festival is celebrating its 15th anniversary as dance music’s most celebrated occasion and the season’s highly anticipated kick off. In that period of time, the lineup has changed a lot — not just in scope but also in sound — but there are names that remain pillars of Miami’s greatest electronic music tradition. These are names who’ve been at it longer than many of us have been walking and they deserve not just a tip of the hat, but also your time and attention at their impending Ultra sets. How will we know where we’re going if we don’t know where we’ve been? Check out DJ Craze if you like A-Trak, Kill The Noise, or Araabmuzik. You think A-Trak has skills on the turntables? How about DJ Craze, the only DJ in history to win the DMC World DJ Championships three times consecutively? DJ Craze is a Miami native by way of Nicaragua and has been showing up at Ultra from the very start. He’s known best for spinning drum and bass, breaks, dubstep, hip hop, and has taken a page out of the book of the greater Miami Bass movement. In more recent years, he founded Slow Roast Records (a Fool’s Gold imprint) with fellow producer Kill The Noise and acted as Yelawolf’s DJ. Check out his insane turntablist skills on Traktor Scratch Pro 2 below. Check out DJ Marky if you like Netsky, Drumsound & Bassline Smith, or Matrix & Futurebound. DJ Marky is a Brazilian drum and bass DJ known for pretty much putting the South American contingency of the subgenre’s core sound on the map. He was first noticed in the late 90s, trekking over from the Southern hemisphere to hang out in London with drum and bass pioneer Goldie, working for Radio 1, and by 1999 being named the UK’s “Best New DJ” by critics. Fifteen years ago he was the new kid on the block, but he’s still showing up in the festival circuit. His 2004 Essential Mix with XRS bolstered his career and the subsequent In Rotation album put his work firmly on the DnB map for decades to follow. Check out Sander Kleinenberg if you like Miguel Campbell, Funkagenda, or Maceo Plex. Another Ultra original, Sander Kleinenberg will return to Ultra this year and his unpredictable set could consist of any type of electronic music. He’s known for trance, progressive house, disco, tech house, and techno, but he prefers to just describe his sound as “house music.” One of his first early breaks was with “My Lexicon,” a track that appeared on one of Sasha’s Global Underground compilations in 1996. He’s been known for his successful party and club brands, taking the “Everybody” and “This Is” parties all over the world in an effort to remove the pretentiousness from dance music. He’s also famous for his ability to DVJ — working with both audio and visual elements (many of which are self-made). Sander is playing this year on the Toolroom Knights stage, sandwiched between Chus and Ceballos and Mark Knight, so we’re guessing his set will be a little more tech house. Check out Stacey Pullen if you like Carl Cox, Tiga, or Magda. Stacey Pullen grew up in the second wave of Detroit techno, learning by doing under the tutelage of the original Detroit legends Derrick May, Juan Atkins, and Kevin Saunderson. He’s released records under a slew of monikers — Silent Phase and Kosmik Messenger among the most well-known, but you can really except the best of everything (techno or otherwise) from him in a live set. Listen to “Sweat” — his first release of his own label Blackflag, and get a feel for the type of tracks Stacey favors: songs designed to go straight to the dance floor. If this isn’t impressive enough on its own, Stacey also spent last season in Ibiza spinning with Luciano and Marco Carola — a move that if anything, serves to bolster his already impressive résumé. Check out Steve Bug if you like Dubfire, Luciano, or Loco Dice. Steve Bug has been a figurehead in the Berlin scene for years, releasing Da Minimal Funk in 1996 and the pivotal “Loverboy” in 2000. Steve Bug and Poker Flat Recordings are basically responsible for what we know today as “minimal tech house” and anyone responsible for pioneering a subgenre of music automatically shoots to the top of a adventurous music lover’s festival must-sees. Check out Marco Bailey if you like Adam Beyer, Umek, or Nicole Moudaber. You may look at the Ultra lineup and wonder: why isn’t Digweed headlining his own Bedrock stage? For whatever reasons he is not taking the reign, the main attraction at this stage is left in the very capable hands of Marco Bailey, a Belgian techno mainstay. Not only are his DJ sets rife with techno purity, but he is quite a prolific producer — counting up seven EPs in 2012 alone and already a new album in 2013. Many of these new releases stray away from more minimal productions and towards no-nonsense big techno, but he’s been doing his thing for over 20 years. If you like beefy bass lines and a rhythm that almost always seems to be in overdrive, Marco Bailey’s Ultra set is surely going to pique your interest. Check out Faithless if you like Underworld, The Prodigy, or Paul Oakenfold. Faithless are a British electronic band that use synthetic elements in time with piano, sax, violin, and bass guitar. 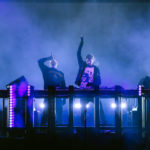 From the mid-90s through their official farewell tour in 2011, they’ve sold million of records and released music that sits them firmly atop dance music royalty. Faithless’s live set could really take any turn — all three members have produced on their own and they’ve not released an album since 2010. “Insomnia” pops up all the time on mixes and in live sets from DJs of all ages, and tracks like “God is a DJ” and “We Come 1” are some of the biggest hits in the genre. This crew are festival veterans and they’ll be second headliners at the Live Stage both weekends. Check out Green Velvet if you like: Steve Lawler, Carl Craig, or Damian Lazarus. Curtis A. Jones is well-known by two names: Green Velvet and Cajmere. The Green Velvet moniker came second and is best known for the 1995 smash “Flash” and all of the remixes that followed. Green Velvet is the darker side of Cajmere, focusing less on mellow house and more on dark and driving sounds. He’s still around making moves on the scene — recently working with Pleasurekraft on “Skeleton Key” and remixing some of his old school originals like “Preacher Man” and working with new generation techno producers like Harvard Bass. Check out Josh Wink if you like Shlomi Aber, tINI, Martin Buttrich. Josh Wink is the third name on this list that appeared in the first few years of the festival. If there is one way to describe a Josh Wink set, I’m going with: trippy. He combines tribal, acid house, breaks, and techno to throw a barrage of competing sounds in the face of his audiences. In the course of his extensive career, he’s held on to much of his original flavor but still remained relevant for younger audiences. Josh Wink will bring classic nineties rave to Ultra this year. Check out Kevin Saunderson if you like Frankie Knuckles, Richie Hawtin, or John Digweed. Kevin Saunderson, one third of the “Belleville Three” with Juan Atkins and Derrick May, is widely considered one of the originators of Detroit techno. His groundbreaking and forward thinking productions began in the late 80s, and are much of what we owe thanks to for the culture and sounds that still surround and bolster electronic music of all sorts to this day. I’ve never seen him live, but you can bet I will make the effort to catch his headlining set on Friday of Weekend 2.